Earlier this week – two decades to the day from the sale of the first Hightail Ale – we ran the first part of a look back at the history of Melbourne brewery Mountain Goat, told through 20 of the people, beers and moments that helped create one of the best stories in Australian craft beer history to date. That focused on the very early years. Today, as they prepare to host the first of a series of 20th birthday bashes at the brewery's Richmond home, we bring the story up to date with the final 11 flashbacks to and from the people, places, moments and beers that helped make Mountain Goat what it is. 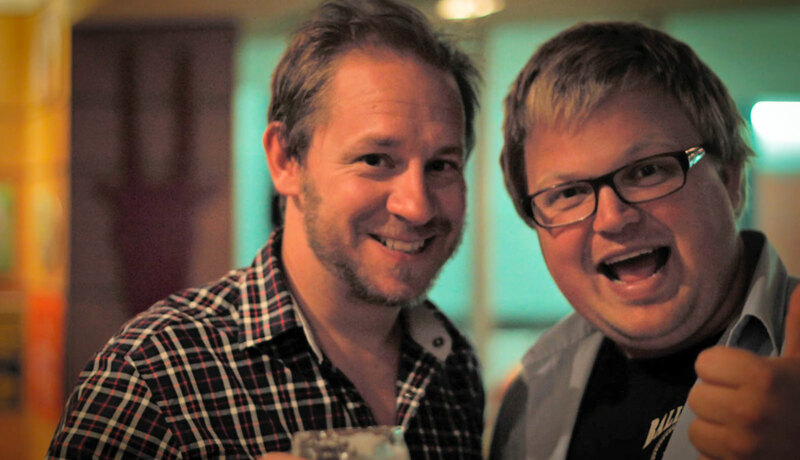 There will be plenty of people around the beer world who know Tom "Tommy D" Delmont (pictured above right giving it the full Donald Trump at the launch of the Thorny Goat with brewery co-founder Dave Bonighton). Today, he's heading up Fixation Brewing in partnership with the Stone & Wood Group but, prior to that, his career in beer was spent as Mountain Goat's first sales rep*. In his time there, he sold (and regularly quality tested) a phenomenal amount of beer for the brewery around Melbourne, became the first non-brewing member of staff to have a beer brewed, bottled and released commercially in his honour (The Delmont IPA) and even ended up with a miniature Tom created on a 3D printer – in his standard uniform of black punk band t-shirt and pale blue Goat shirt – to affix to tap handles. "Wow! No excuses, I thought. I am going to apply for a risky, part-time, 30 hrs per week On Road Goat position within a shaky beer business that was just breaking even. "The guys were looking for someone like me – new to the industry and keen as mustard. Someone without all the preconceived ideas about approaching venues, and who is good to deal with. Someone who had no idea of the difficulty faced with being a self described, staunchly independent microbrewery in an industry of global mega-corporations, marketing funds and tap contracts. * Sam Howard (see part I) tells us she was actually the first On Road Goat for a brief period and "made the most Goat accounts in one day" but we'll leave her and Tom to sort that out in private! In her last port of call before launching Two Birds Brewing with mate Danielle Allen, Jayne Lewis was head brewer at Mountain Goat. 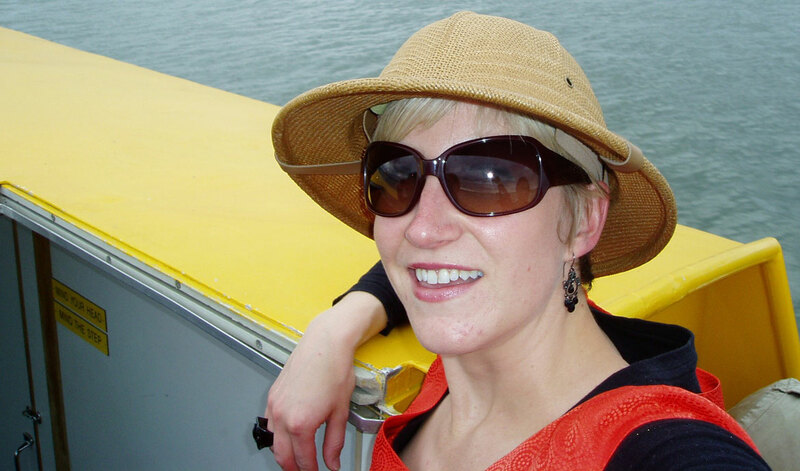 She joined in February 2008, having worked previously in the wine industry then for the likes of Matilda Bay and Little Creatures, and was tasked with, among other things, a spot of "elephant hunting". "Cam and Dave had been doing great, but as they started to sell more beer and it went further afield, they realised that they needed some more technical input in the brewery," says Jayne. "They were beer artists and needed to bring some more science to their art. That's where I came in, about ten years ago. "I had a major project that I was working on and its codename was Elephant Hunting. "One Christmas, Dave gave me a pith helmet and, to distinguish the days when I was working on my project, I would wear it around the brewery as a sign for people not to distract me. It was kind of like my own personal cone of silence. "You'll be pleased to know that the symbolic elephants were slain and now the pith helmet sits in my office as a reminder to be alert, but not alarmed, about ever present elephants." 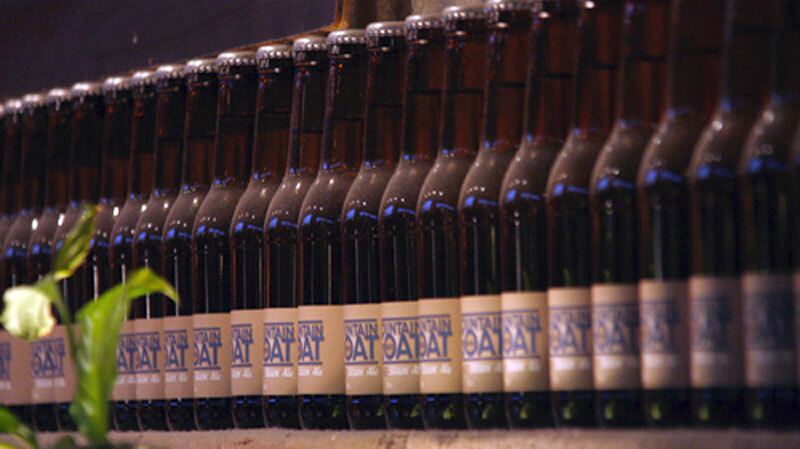 Bottles of the first generation of Steam Ale lining the brewery bar back in 2009. "Steam Ale came at a pivotal time for us," says brewery co-founder Dave Bonighton. "It was 2009 and the first year we hadn’t recorded strong growth. We were doing OK but, with the GFC in full swing and with more than ten years under our belt, we needed some fresh inspiration. It came with Steam Ale. "Steam Ale was a basically a blend of a couple of Goat Bar summer favourites: Skipping Girl and Goldilocks. Light body, a little wheat malt and a hoppy aroma at 4.5 percent ABV. "When Steam Ale was launched, we also took the chance to rejig our labels. So, with a fresh new beer also came a fresh new look (for Hightail, too). Steam became our biggest selling beer only a year later, and has remained our biggest seller ever since." "This one actually originated at Crafty Towers," says Dave. "Mikkeller, renowned gypsy brewer from Denmark, was coming to Melbourne in March 2012 and doing a couple of events with Crafty at the Melbourne Food & Wine Festival. He put us together on email to see if we could come up with a collab brew. "I wanted to do something uniquely Australian and suggested Tasmanian pepperberry in a black IPA (black IPAs were all the rage in 2012). Mikkel’s a pretty laid-back character, and said, 'Sure, go for it.' The beer became one of our most popular Rare Breeds. "Crafty also had an event in mind. A mate whose café he frequented was part of a secretive group going by the name The 36 Collective that was looking to put on pop-up events. Among their number was Casey Wall and Manu Potoi (who have since gone on to launch Rockwell & Sons and Bar Liberty) and Josh Elias (wine guru and editor of Alquimie magazine) who put together a crack kitchen and front of house crew to put on the dinner for 30-odd people. "It was chaos, but just the right amount of chaos. The food was incredible. The beers were pretty good, too. "Over the years, we also got to brew with Thornbridge Brewery (here and there), Brooklyn Brewery (here and there), Great Leap Brewing, Hitachino Nest and a bunch of local breweries. Collaborations are a heap of fun, and there was always some little brewing nugget that we would come away with…"
Watch a short video of Gypsy & The Goat here. 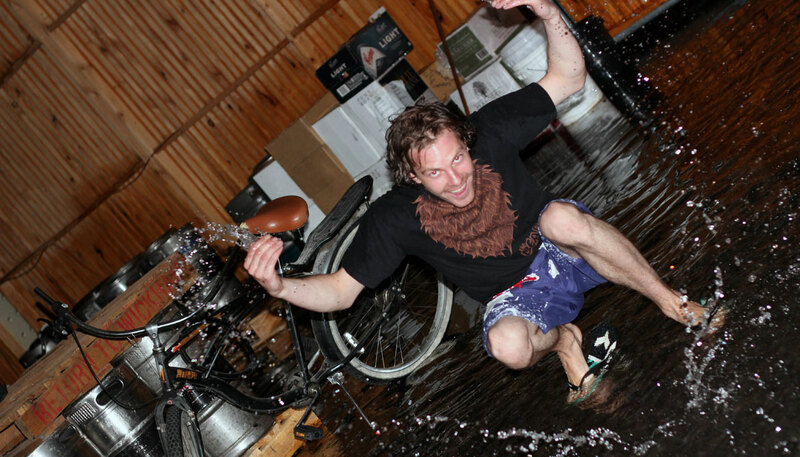 Shane "Naz" Edwards making merry during the brewery's biggest flood to date. 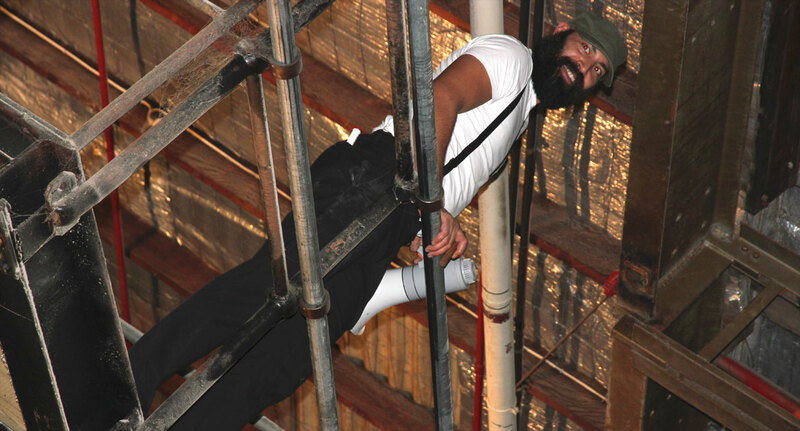 An ever-present at the brewery since before The Crafty Pint launched is Shane "Naz" Edwards. He first started out making pizzas behind the bar before moving across the floor to join the brewer, where he's been ever since, conceiving a few beers – usually dark and malt driven – called The Naz along the way. "Having spent all my brewing career in the four walls that are 80 North Street, I’ve grown quite fond of a few quirks in the building," he says. "From the weird slicks that used to appear from the floor on humid days (a byproduct of its former life as a tannery) to the strange ‘Black Box' above the bar area, but my favourite would have to be our storm water system. "When 80 percent of your roof space drains into one small sump pit conveniently located in the middle of the brewery, it can get a little exciting when it rains. And if that rain is one of those red blotches on the radar then look out. "One such incident happened on a Friday night midsummer, when the heavens opened all of a sudden and, lo and behold, water starts pouring from the pit. Nothing to worry about – it will pass. "Then water started coming under the roller door as North Street became North Creek and we started getting a little worried/excited. The final blow was the rainwater tank and box gutters overflowing, sending punters scrambling for what little dry space remained. When it was all said and done, the bar area was a three inch deep wading pool and the brewery was a little deeper. "But many hands make light work and, with a couple of people on the mops, three or four towels from home and a little surefooted grunt, the bar was dry enough to start serving again. As for the brewery, it would keep til Saturday. "It's even funnier when we get a good hail storm." CraftyPint - GoodBeerWeek Abbotsford Collaborative Brew from The Post Project on Vimeo. "We blew up Untappd once in our time," says Dave. "It was the launch of the third Abbey Collaby – a concept first imagined by the Good Beer Week team for the original festival in 2011 (see video above). It was to be the three Abbotsford breweries, one big (CUB), one small (Goat, technically in Richmond) and one even smaller (Moon Dog), to brew a beer together. "A lot of people were aghast that we’d brew a beer with the big boys, but it was completely natural to us and Moon Dog. At the end of the day, they’re brewers too. We’d known a lot of the CUB guys over the years – many had even helped us out with technical advice. "We brewed a Belgian Dubbel. Goat supplied the brewhouse, Neil Witthorn from Matilda Bay (now at Stone & Wood) supplied the gravitas, and Moon Dog brought the waffles and raisins, which promptly went into the boil. It was the perfect collaboration. "Two years on, at the launch of the third collab – an India Red Rye Rauch Rye-less* Ale – at our place, on the Wednesday of Good Beer Week, the place was heaving. We had a queue outside, and we were the number one check-in globally on Untappd. The fact that it was a Wednesday and the northern hemisphere was asleep at the time may have had something to do with it, but we’ll take it. "I believe the Royston Hotel, down the road from us, was also number three on Untappd**. ‘Twas a good night." The venue manager at the time, Sam Howard, recalls it well too: "It just went off – chockers full of all the beer community… so much fun, resulting in [Stone & Wood co-owner] Brad Rogers, [Cryer Malt founder] David Cryer and the guy who brews for Aldi playing lawn bowls with kegs down North Street at 10pm..."
* It was supposed to be an India Red Rye Rauch Ale but they realised there was bugger all rye malt at Matilda Bay on the day. Over the years, Miro Bellini has been many things to many people: barman, beer educator, Good Beer Week co-founder and Festival Ambassador, weightlifter, star of funny shorts and social media memes, Good Corn Chip Week founder, Brooklyn Brewery Ambassador, burnin', burnin' hunk o' love and more besides. He was also the man taking the Wednesday tours at Mountain Goat from 2011 to 2015 – a role he once told us he hoped to do forever. But his connection with the brewery goes back well before that three-and-a-half year stint. "It was midway through the World Cup in 2002, we were at The Commercial Club hotel and I was about to lose $5 on Australia," he recalls. "My friend who was working at the pub had been banging on about this Mountain Goat beer. 'You have to have it,' he says. "I did. And it blew my mind. I spent the rest of the afternoon trying to describe that pint of Hightail. I didn't know about the words craft or microbrewery. I'd never worked in a pub." 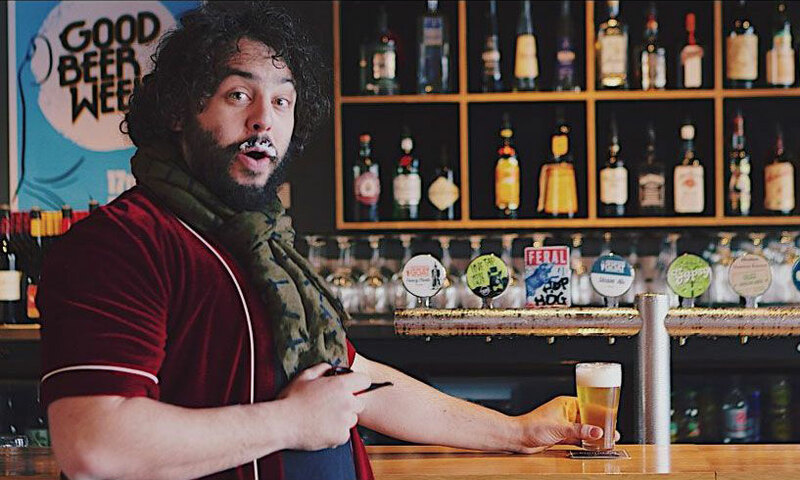 Within two years of that pint, he was hosting tastings and, years later, after helping on the Goat stand at the Tassie Beer Fest, was told to get in touch with venue manager Sam about further work. "I'd just fallen short in the the interview process for a rep position," he recalls, "but was told there might be some work for me in the brewery bar team. Sam needed a bar supervisor, and I wanted nothing of it. But I wanted in at Goat to be close to beer. "I thought we were catching up to chat – I only found out it was a job interview when she congratulated me for showing up in thongs and a t-shirt. She was unimpressed with the stiffs showing up in suits. Had I known I would have worn a collar. 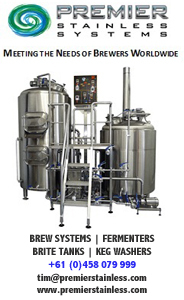 "Somehow, we decided the best way forward was to get me to run tours instead of the brewers. It was bliss. At the end of the first tour I ran, people applauded. The brewers and everyone made me feel so welcome. "Mountain Goat always felt like the Smurf village. Everyone was celebrated for being themselves, and people would be whistling while they worked. I hadn't seen anything like it. It was never about being better then anyone, it was always about doing your job well. There was a real humble vibe that I will measure every brewery against forever more." 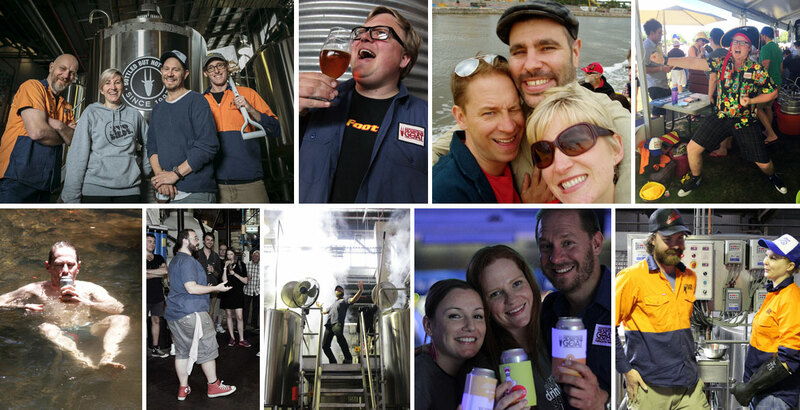 While the tour hosting ended in 2015, the connection with the brewery lives on at home: Miro met his partner, Sophie, when she would walk her dog – "Now our dog," he points out – around to join in on the weekly trivia night. At some point in 2012, we received a call from Goat co-founder Cam Hines. "I'm trying to work out what to do for our 15th anniversary and have an idea," he said. "But I can't work out if it's brilliant or dumb." Once he'd explained his plan, the answer was simple: "It's brilliant and it's dumb. You have to do it." "We wanted to have some fun for our 15th birthday and knew we needed to do something more than just a quick whip around of the capital cities," says Cam five years on. "So Dave, [sales manager] Wags and I hopped in my office and we started searching for obscure and distant places in Australia and came across this cat Kai Hansen on Goat Island, NT (pictured above centre). "I called him up and straight away realised we had to go there. And when we got there it was pretty mind blowing. The isolation, the beauty of the Adelaide River and that massive population of crocs just waiting for an opportunity to feed. Kai himself is amazed he has not been taken yet." While there, they hosted possibly the least likely beer dinner in history for a gaggle of old friends of the brewery, some of Kai's mates and a few river dwellers, with Triple Hightail proving a surprise hit, as well as following Kai as he led his "pet" crocodile for a walk around the tiny island and making sure not to dip any toes in the water. Check out the short film of the trip here. While the Australian Brewery had been the first Aussie micro to can its beer, it was Mountain Goat's Summer Ale that helped raise the profile of craft beer in cans. 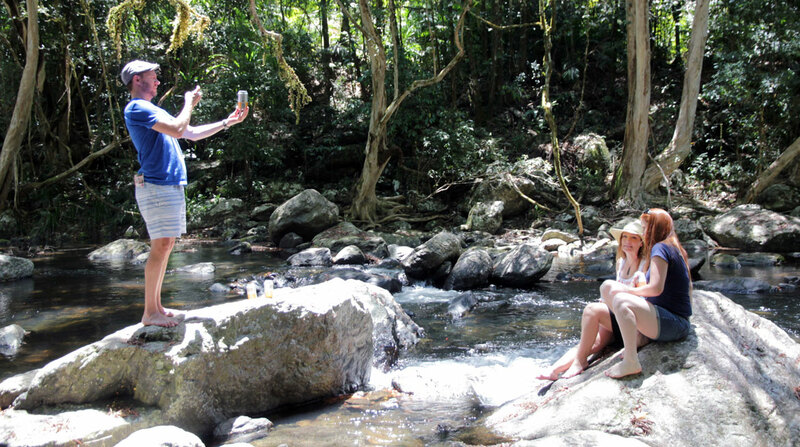 Remarkably, given their prevalence today, the first Summer Ale tinnies appeared as recently as late 2013 when, emboldened by their trip to Goat Island, they took to the road again to launch them at a bowling alley in Far North Queensland – cans in Cairns, geddit? They initially planned to put out just a single batch to cover the summer months but almost immediately had to order a second. Then a third. 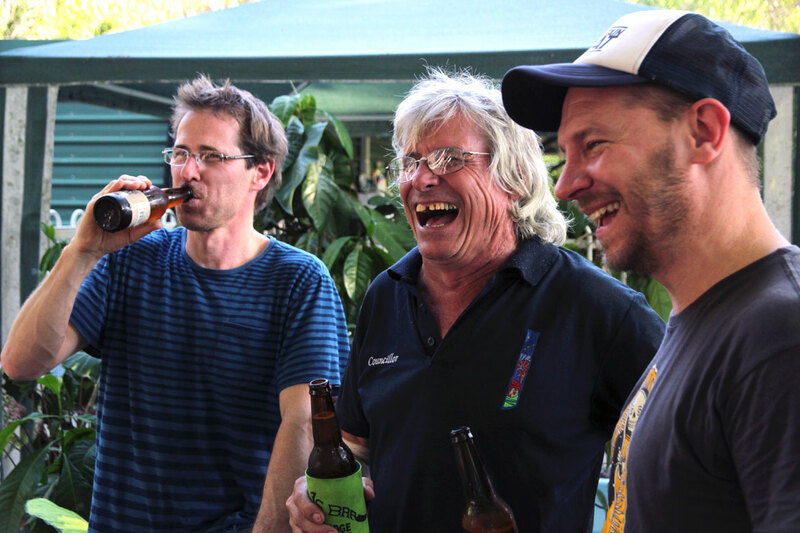 Says Cam: "We had long loved the idea of putting our beer in cans but no one in Australia was doing it at our end of the market, except the Australian Brewery. I think we hesitated because we were concerned about the traditional perception that beer in a can was cheap and a bit one dimensional. "But, when we took the leap and brought Summer Ale out, it just seemed to resonate straight away. Finally, we had a good beer we could take to Meredith and on camping and sailing trips. "That beer quickly became our second best selling product and saw explosive sales through the summer months. We just couldn’t make enough of it." 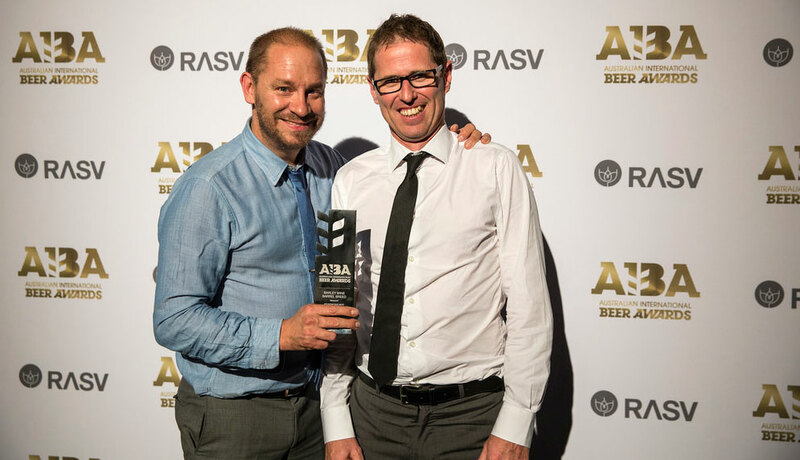 At the 2015 Australian International Beer Awards, the biggest cheer of the night came when Mountain Goat was announced as winner of Champion Australian Beer for its Lark Distillery aged Barrel Breed Barley Wine. 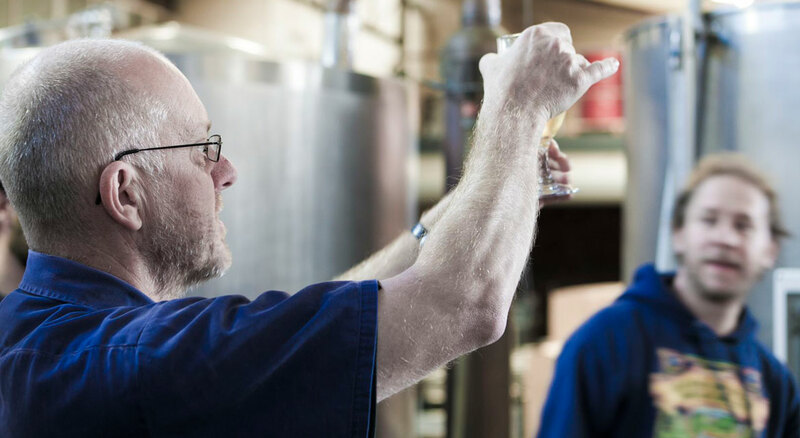 "No doubt," says Dave, "it was one of the absolute highlights as a brewer. "We’d played around with barrels over the years, wine barrels usually, but we were never really convinced. It wasn’t until whisky barrels became an option that we had the notion to make a big barley wine and stick it away for a few months. The beer that won the big gong was our first attempt. "[Brewer Craig] Westy [Westwood] and I went down to Hobart to spend the day sniffing and rolling oak around. We picked out what we wanted, then had the rare treat of a whisky (and maybe gin) tasting with the distillers themselves. It was one of those days you pinch yourself that this could be your job. "Taking the stage on AIBA awards night was surreal. Although we’d won our share of awards over the years, we’d never got to the really pointy end. At the time, we were a fair way down the track in our discussions with Asahi, and I think we’d made the mental decision that we would sell. "So, there we are on stage and on top of the world, about to walk away from it. It was a lot to take in. And, as far the ongoing negotiations with Asahi went, winning Champion Australian Beer didn’t hurt one bit." That night was one of many highlights for another Dave whose life has intersected with Goat often over the years. Dave Edney, now working for Hop Products Australia, was a regular at early nights in Crown Street (see part I) and went on to work with Mountain Goat in various roles over the years – installing their first bottling line and labeller in 2004, their first pair of 100 hectolitre tanks, a keg cleaner and filler among other items, before returning as head brewer in August 2011 when they were installing the current brewhouse at the start of a period during which production tripled in three years. Dave Edney (left) in his time as Mountain Goat head brewer. He describes his various stints as "very much like a kid growing up from infancy to adult ... everyone along the way has played their part in nurturing it into the business it is today. And, like anything growing up, it has had its rough patches, happy/funny times and crazy times but, overall, I think it’s grown up to be a pretty rounded business and looked after everyone that’s been a part of it." Other highlights included "watching a few of the brewers 'surf the wave' as we called it. During dry hopping, brewers would add hops toward the end of fermentation. Occasionally, the tank would overflow with foam, spraying brewers, other tanks and various parts of the brewery with beer. Some even tried to hold a cap over the port to try and stop it but it would just spray even further afield." Then there's the back-to-back IPA trophies at AIBA, travelling to the US with the other Dave to brew Ridgy Didge with Brooklyn in 2014 followed by a trip to the UK the following year to brew Hightail at Hook Norton for the Wetherspoon's Real Ale Festival in 2015 – and much more besides. "Overall," he says, "seeing where the brewery had come from in 2001 when I first starting drinking there to where it is now: there is a massive difference and you can lose sight of how much has changed over the years, how much effort everyone involved or who has worked there has actually put into it. "I worked with an absolutely awesome team of brewers over the five years I was there, easily the best people I have come across in my brewing career." 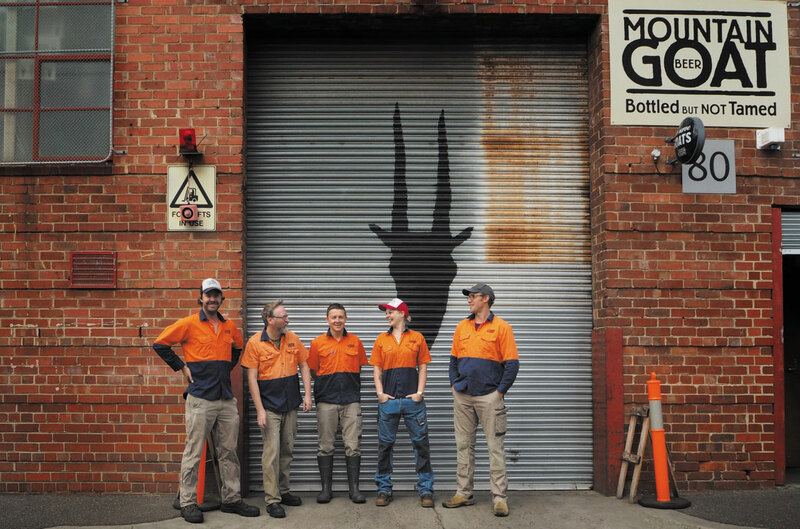 It's fair to say news of Mountain Goat's sale to Asahi was a moment that shocked many, even though rumours had swirled for some time and the Japanese company had been brewing most of Goat's beers at its Laverton site for a number of years. There were staff in tears, venues that took their beers off tap never to return and, within weeks, the departure of almost the entire local sales team. As with 4 Pines in recent weeks, some drinkers wished those that had built the business well but said they'd be spending their beer money on other local, independent brewers. Today, it is a different beast, but much remains the same. Dave Bonighton is staying on in a part-time role, while Cam Hines is moving on, having helped a new team get established and take over running the show. Much of the brewing team that was there before the sale remains in place (pictured above) and has been knocking out more Rare Breeds, Barrel Breeds and one-offs than ever before while snapping up three more AIBA trophies since the sale for beers brewed at Richmond. "Two years on, we’re sure we made the right call to sell to Asahi," says Dave. "We’d been at it for 18 years, seen so much change, had had a ball, but it was time for us. "At the same time, we had a suitor that understood us – we’d been contract brewing with them for nearly three years – and we got along with them. We thought they could take Goat to a level that we couldn’t. "They’ve really left Goat alone, especially in Richmond, to get on with things. I think the brewers especially are having a better time than ever. They get to experiment more, do more single keg, fun stuff. It shows at the bar – so many great beers to choose from! And, at the end of the day, Goat is thriving with Asahi. It’s growing strongly and reaching more and more corners of the country." Thanks again to everyone who helped put this together, in the case of part II: Cam, Dave, Dave Edney, Jayne Lewis, Tom Delmont, Miro Bellini, Sam Howard, Zoe Ottaway and Shane Edwards. Apologies if there were juicy bits that hit the cutting room floor. You can read part I on the early days here or get along to one of the 20th birthday parties around the country.